With the start of the 2011 Formula 1 Malaysia Grand Prix, excitement is building around the series. Today take a look at one of the components of racing few people get to see. The same thing that every driver stares at while racing and holds with a death tight grip as if their lives depended on it... Oh wait, their lives do depend on it! Wired Magazine published this video featuring Nico Rosberg of Mercedes GP Petronas to explain how the complex steering wheels on F1 cars work. 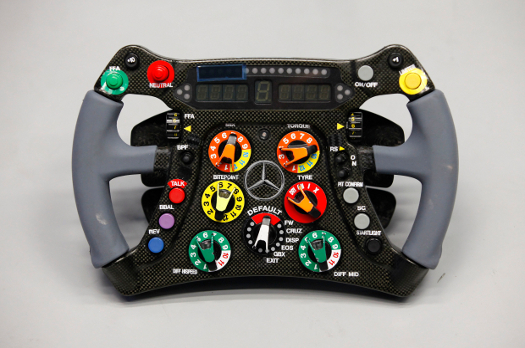 recently broke down their driver’s Formula 1 steering wheel button by button. 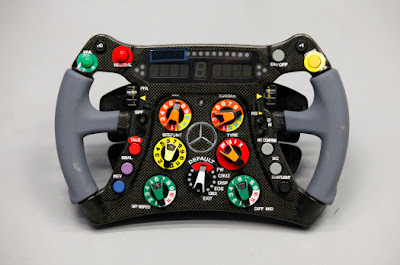 The steering wheel is used for much more than just steering the F1 car around the circuit, it is the driver’s main interface with his car. The steering wheel is an extremely technical piece of equipment that allows the driver to view information about the car and allow him to tune the car to suit different track situations that may arise. Shift Lights: The row of lights across the top of the steering wheel which shows the optimum point to change gear. Gear Number: Shows the driver which gear he is currently in. Marshall Lights: This cluster of three lights on either side of the display comes on if there is a red flag (race or session stopped), blue flag (a faster driver is lapping you) or yellow flag (incident ahead). These lights are switched on or off by the FIA Race Control and were introduced to help the drivers who sometimes find it difficult to see the flags waved by the marshalls. Displays: The two display windows on either side of the gear number shows the driver important data such as oil or water temperatures. They can also show his laptime and during qualifying, he can see whether he is quicker or slower to a reference lap (normally his fastest lap). +1/-1: These control the fail-safe software programmed into the car. If the engineers see a problem developing with a system or sensor through the telemetry, the driver can switch off or disable the relevant sensor if it is not safety critical or if activate a back-up sensor. The driver uses these buttons to scroll to the relevant mode and then uses the ON/OFF button to enable the mode. +10/Start Lights: This button has two functions. The +10 part is linked with the fail-safe modes of the +1/-1 button and allows the driver to ‘fast forward’ to the relevant number by 10 steps. The start light function is used during practice sessions when you will often see drivers carrying out practice starts at the end of the pitlane. He presses this button and the shift lights at the top of the steering wheel simulate the way the lights work at the beginning of the race. The engineers can then analyse reaction times. O/Take: Can be used when a driver is fighting for position during a race and allows the software to momentarily raise the rev limiter (although not beyond the controlled 18,000rpm maximum!). Pit Confirm: The driver presses this button to acknowledge that he has heard the engineer’s call or pit board signal to pit on his current lap. This is useful at circuits where the radio coverage is not so good. Talk: Allows the driver to talk to his engineers over the radio. BBAL: A shortcut button to show the current brake balance on the display. REV: The driver can’t select reverse using the normal gear paddles so he has to press this button (at the same time as pulling in a clutch paddle) to put the car into reverse gear. Rotary Switches: These switches can control a number of functions which the driver and engineers will define. 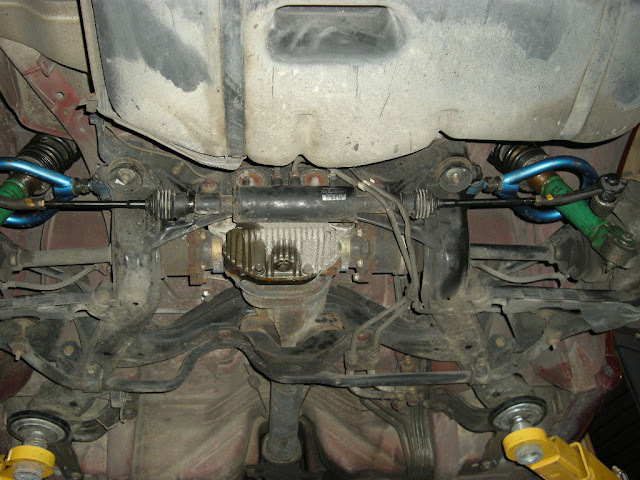 Each position of each switch subtly changes a particular characteristic of the car, for example a mixture mode, the hydraulic differential or the torque map of the engine. These switches also come into play if a safety car comes out in the race or if it starts to rain to allow the driver to tune the car to his liking. FFA: This allows the driver to adjust the position of the front wing angle. Using this switch (which stands for Front Flap Adjust) moves the front wing allowing him to adjust the aerodynamic balance. Mark: If the driver feels something strange with the car or a point of interest, he can press this button and the engineers can pinpoint the data to analyse the issue. ON/OFF: Used with the +1/-1 buttons to switch on or off a fail-safe mode. Neutral: Similarly to the reverse button, the software stops the driver accidentally selecting neutral from the gear paddles. He has to press this button to go to neutral. 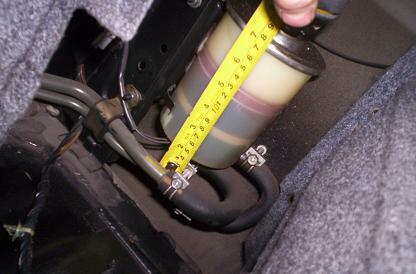 Pit Limiter: Enables or disables the pit lane speed limiter. At most races, the speed limit is 60km/h for practice sessions and 100km/h during qualifying and the race. Pressing this button too late (or not pressing it all!) can result in the driver receiving a fine in a practice session or a time penalty during the race. BPF: Stands for Bite Point Find and is used by the engineers to analyse the characteristics of the clutch. This is then fed back to the driver to optimise his procedures during the race start process. Now that traction control and launch control is not allowed in Formula One, the start of the race has to be completely controlled by the driver so it is crucial for him to know how the clutch is going to react.